In the exquisite seaside getaway that is Viareggio in Tuscany, Carnevale is characterized by a festive parade of gigantic floats and masks, where the revelries here can rival those held in Venice. The Carnevale di Viareggio attracts up to six hundred thousand tourists every year and is one of the most famous events held in Italy. Massive floats are prepared in the months leading up to the celebrations, depicting caricatures of currently popular showbiz icons, political figures, musicians, and sportsmen, all of which will be paraded on the Art Deco promenades along the breathtaking seaside boulevards of Viali a Mare. These highly complex behemoths are works of art unto themselves, often rivaling the surrounding buildings in size, can weigh up to forty tons. The time it takes to make a single float can take anywhere from a few months to an entire year. They are usually created by renowned local artists and are incredible sights to behold, so you don’t want to miss them. Because the party goes on all month long, it’s easy to plan your itinerary. Catch the parades on the 12th, 18th, 26th, and 28th of February and the 5th of March. Daytime parades start at 3:00 PM while the night parades kick off at 5:00 PM and culminate in a dazzling fireworks display. Admission fees will be charged, but other cultural events and musical performances are offered free of charge and go on intermittently during these weekends. Viareggio is easily accessible via car or train from Pisa, Lucca, Siena or Florence. Meanwhile, in the Piedmontese town of Ivrea, people celebrate Carnival in a way that can only be described as “citrusy”. In this quiet little corner of Turin, the Battle of the Oranges is celebrated every year – and we’re talking about the fruit here, literally. Stockpiles of oranges are kept in wooden crates on the streets on the day of the festival. Once the celebrations begin, you’d better have your throwing arm and best ducking instincts ready. The festival seeks to commemorate the overthrowing of a vicious tyrant who used to rule over the city with a cruel iron fist. Citing primae noctis, he attempted to claim a miller’s young daughter for himself on the eve of her wedding night – only to die by decapitation at her hands. Her act of defiance sparked the people’s revolutionary spirit, and they then stormed and burned the tyrant’s palace, taking his men down with whatever makeshift weapons were available to them at that time. Today, those stones are represented by oranges instead, as throwing actual stones at people is likely to cause severe bodily harm. Spectators are encouraged to participate, but getting hit by fruits is still essentially guaranteed if one chooses to go out into the battlefield. If you are unwilling to take an orange to any part of your body, you can still watch the show from any of the buildings in the surrounding area – a safety net will be provided to catch any errant airborne citruses. This festival usually takes place between the 6th and 9th of February. Finally, if you think that the Venetian or the Viareggio Carnivals go on long enough, the Carnival in Putignano, in the Bari province, goes on for even longer. It starts on December 26th and ends on Mardi Gras, with an evening parade and the “funeral” of Carnival. 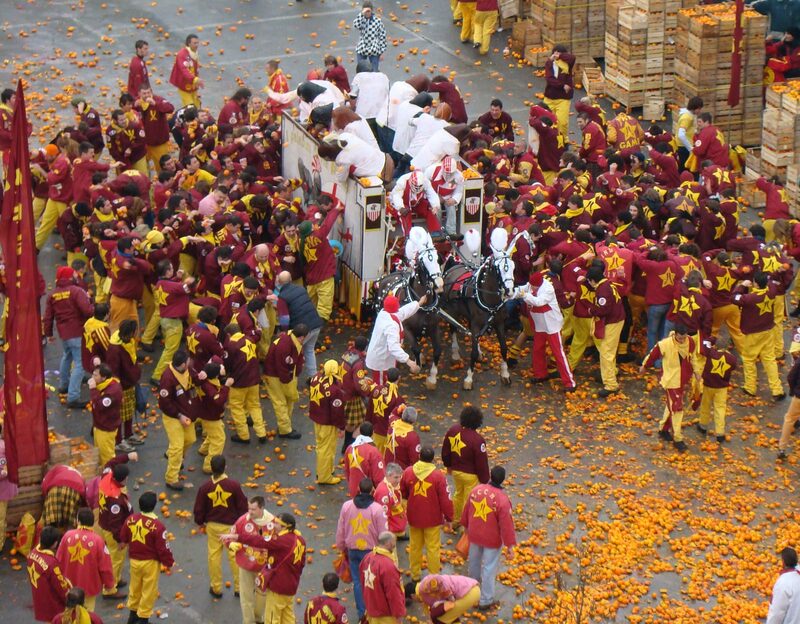 It is one of the most ancient festivals in Europe with origins dating as far back as 1394. During this time, the Knights of Malta moved the relics of the blessed St. Stephen from the duly named St. Stephen’s Abbey into Putignano, inland, in order to protect them. It is said that the farmers of Putignano stopped their work when the saint’s remains arrived and followed the religious procession. When it was finished, there was much joyous celebration. Aside from the characteristic masks and floats that are part of the Carnevale festivities, here you can catch the traditional propaggini, poets taking center stage at the town plaza, who recite hours of satirical rhymes for the entertainment of the masses. So if you’re looking for some of the best parties to attend this February, there are a lot of good choices available. Carnevale is one celebration that you definitely shouldn’t miss and comes in several unique “flavors” that make them an interesting spectacle for everyone to enjoy.